It’s finally December and I can’t wait to share some of my favourite Christmas recipes. What better way to start off the festive season with these honey dipped beauties – Melomakarona. They are often baked at Christmas time and have all the usual flavours of Christmas – cinnamon, orange zest and honey. Each oval shaped biscuit is dipped into a simple honey syrup and then sprinkled with toasted ground walnuts and cinnamon. 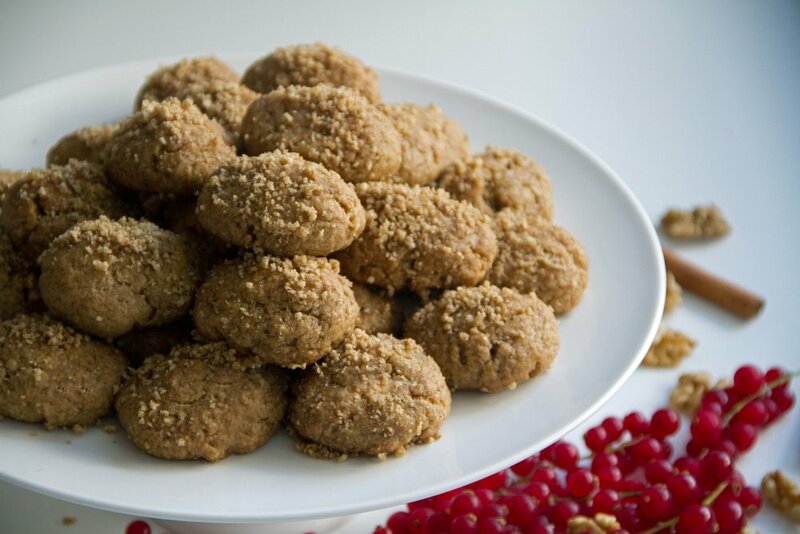 My version is prepared with spelt flour, extra virgin olive oil and sweetened only with honey. They are not overly sweet and definitely worth a try if you are dairy intolerant or cutting back on processed sugar. Note: while honey is a natural sweetener it’s always best to eat sweetened desserts in moderation. You can adjust the sweetness when dipping the melomakarona into the syrup. The longer you leave them in the syrup, the sweeter they will be. Don’t leave them longer than a minute. Preheat the oven to 160°C/325°F/Gas 2 and line two baking trays with baking paper. Place the flour, semolina, cinnamon, cloves, baking powder and bicarbonate of soda into a large bowl or into the bowl of a stand mixer. Whisk the dry ingredients to combine and remove any lumps. Place the olive oil, honey, orange juice and orange rind into a jug and mix well. Pour the liquid into the flour and mix until it forms a pliable dough. You can use the dough hook on a stand mixer as well. Take heaped tablespoon fulls of dough, roll into oval shapes and place them onto the baking tray, leaving some space in between. Bake for 40 minutes until lightly golden and leave to cool for 10 minutes while you make the syrup. For the syrup, add the water and honey into a pot. Bring to a boil, then reduce to a simmer and cook for 10 minutes. For the walnut topping, toast the walnut halves in a dry frying pan for a few seconds just until you can start smelling the walnuts. Remove from the pan. Blend with the cinnamon in a small food processor until finely ground. To assemble, dip each biscuit into the syrup for a few seconds (maximum 1 minute). Roll them over until they are well coated in syrup, then place them onto a serving plate (I do four at a time). Sprinkle with the walnut topping while the syrup is still wet. Repeat with the remaining biscuits. Store them in an airtight container once they have cooled completely.